I caught up with track cyclist Kaarle McCulloch last week to hear about her challenging last few years and her future plans to be in the team for the Rio Olympic Games next year.Like many female cyclists Kaarle didn’t take up cycling until fairly late in her sporting life. Up until the age of 15 she was firmly focused on running but realised that she was pretty good, but not quite good enough to go the Olympics, a dream she had harboured since she was 12 years old. She had no interest in cycling but was persuaded by her step father Ken Bates who had a keen interest in the sport to give it a go. It only took a few laps on the track and she was hooked. That was at her local track in Sydney’s south, and within a few short period of time she was holding her first junior world medal. 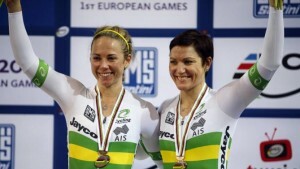 By 2008 she was riding alongside Anna Meares and her sister Kerry in the senior world champs and World Cup events. She attributes her early success to the work ethic she had developed in her running. Once she’d established herself as a track sprinter she moved to Adelaide where she trained alongside Anna Meares. For Kaarle this move was great at first, but over time she found the comparisons with her higher profile team mate was just too much and she moved back to Sydney. She describes that move as a scary decision because the track high performance coaching is based in Adelaide, and it could have been a career-ending choice. But more scary decisions were to follow. In January 2014 she forfeited selection for the Commonwealth Games and World Championship teams to focus on an injury she believes she sustained in a crash on the road in 2009. The niggly knee pain she was suffering was holding her back and she was determined to get better or leave the sport all together. She attributes her recovery to her physio who found the problem was not with her knee, but her back and through a series of rehab exercises she slowly overcame the injury. She describes her recovery as transformational. Kaarle is now a happier person all round and it’s showing in her results where she teamed up with Anna Meares in the recent World Champs to take bronze in the team sprint. That’s given her the taste and she’s now firmly focused on Rio. And like all good athletes she’s focused beyond that to the 2018 Commonwealth Games where she hopes her sister will also represent Australia in netball. Other aspects of Kaarle’s life have turned around with the reinstatement of her AIS scholarship, something she lost when she chose not to be considered for the Commonwealth Games in 2014. Kaarle and I also discussed her visit to Japan in 2013 where she raced in the Girl’s Keirin. From when she and Kiwi track sprinter Paige Paterson landed in Tokyo it was like entering another world. “We were brought in to gain some publicity for the new sport of ‘Girl’s Keirin’ racing in a very traditional sport. It seemed to work because while we were there the betting tripled,” said Kaarle. And Kaarle is keen to go back but it will have to wait until after the Rio Olympics. I also asked Kaarle what she thinks we need to do to encourage more women to cycle. She has recently discovered a couple of Sydney bike paths that she thinks need to be promoted more. She doesn’t like to ride on the road because of the dangers, and feels that this is holding many women back. Great idea Kaarle. Let’s all do more to promote the hidden bike baths of Sydney. I’m relatively new to sydney, and my busy schedule means finding a club or companions is difficult. I’d love to know some of the hidden paths in the inner west… All the best with RIO Kaarle…. When she is racing we yell like hell. We know that she will be off to Rio, Sean Eadie will push her to get the best out of her. We wish her every success in the future, & we will be yelling like hell for her.